In recent years, New York City Ballet's galas have often revolved around fashion, with big-name designers creating costumes that seemed to lead the ballet premieres by the nose. This week that changed a bit, reverting back to a focus on the choreography and dancers. The major premiere is Chris Wheeldon's American Rhapsody, a cousin of his huge Broadway success, An American in Paris. Both star Robbie Fairchild, whose return to the Koch stage is welcome news. The second premiere is Mothership, by Nicholas Blanc. Preceding the curtain rising on American Rhapsody, the finale of the May 4th gala program, Wheeldon ascended on the massive orchestra elevator alongside guest conductor Rob Fisher, with whom he worked on Broadway, and the orchestra, of course. They proceeded to engage in a modified lecture-demo, akin to NYCB's "See the Music" series, discussing Gershwin's familiar musical lines and how Wheeldon thought about them in terms of movement. While informative, it perhaps tested the patience of the gown and tux clad audience. 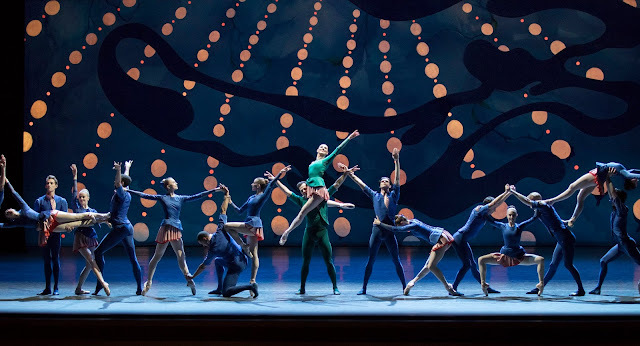 Finally, the orchestra descended and the haunting opening clarinet line rose, which Wheeldon described as a grin spreading across one's face, revealing Leslie Sardinias' sea urchinesque painted backdrop, and a group of dancers slouched over. That affect—a Bob Fosse loucheness—popped up now and again in Wheeldon's mostly balletic romance featuring Fairchild and wife Tiler Peck, with Amar Ramasar and Unity Phelan as the second primary pair. Limp paw hands and knocking and swiveling knees were jazzy notes among the classical phrases. NYCB ex-principal Janie Taylor designed the costumes in gemstone colors. The women wear fitted asymmetrical jackets over pleated pink skirts that were oddly unflattering, the men in similarly cut tunics. The lead couple wears bright green, which, while helpful in spotting them dashing through the corps in blue, is not the most flattering shade. Comparing the dance to the Broadway show by the same team is perhaps unfair, but a short film spotlighting American in Paris which preceded the live segments pretty much forced the issue. The long dream ballet in the Broadway show succeeds in part because it's surrounded by song and dance razzmatazz. Essentially a pulled-out long ballet, American Rhapsody feels weaker as it isn't contrasted as such. And there's no doubt Fairchild is a leading man capable of charming the broader public; he and American in Paris costar Leanne Cope had a smoldering chemistry that stemmed from her mystery and reluctance. But with Peck, there's little mystery, if a genuine affection and naturalism. There isn't really any doubt they'll wind up together (I mean, their costumes are the only green ones!) so there's little tension. In other pairings, Fairchild and Ramasar have wonderful stage chemistry; Ramasar would be a natural on Broadway as well, and he and Phelan dance with verve and swoop. Despite some of these minor quibbles, the dance is entertaining and rousing and far more rewarding gala fare than some of the costume-driven spectacles of recent years. Nicolas Blanc's Mothership came about from his stint at the New York Choreographic Institute, which is affiliated with NYCB. The title is taken from the musical composition, by Mason Bates, in residence at the Kennedy Center. Its claim to fame seems to be that it was originally performed by the YouTube Symphony Orchestra (did you know this exists?) and has gotten 2 million views. Its swelling lines recall what might accompany an Olympics highlight reel, and it propels the dancing by four pairs, all corps or apprentices. There are some unique moves that distinguish the classically-rooted vocabulary—a side step on point alternates with one on a flat foot, a man manipulates a woman's développé—but not much to distinguish it from numerous other dances. The program led off with Ratmansky's Concert DSCH, which remains packed with delightful flourishes and movement surprises. Anthony Huxley, sprightly and more expansive than ever, partners with Brittany Pollack and Gonzalo Garcia (at his best in this role) in the buoyant allegro trio. Sara Mearns assumes the role originated by Wendy Whelan, paired with the ever-smooth, strong, and debonair Tyler Angle. Ratmansky's flair for creating small dramas within the onstage communities he builds remains one of his strengths as his choreographic output increases and broadens over many major companies. The opening section of the gala program was a video tribute to NYCB board chair Jay Fishman, whose company, Travelers, received a nod when a red umbrella opened at the end of an excerpt from Jerome Robbins' The Concert. It was no doubt appreciated by the ailing Fishman, even if it was the dubious intrusion of the corporate realm into the artistic.